September is quite a month for celebrations in the Parfitt household. Harry's birthday on the 4th, followed by Fathers Day (the most important day of the year, of course) and then a few days later Alex's birthday. One of the greatest things about having kids is being a part of, and enjoying their absolute excitement that they see in the simple things in life, things that we as adults perhaps have lost the art of enjoying. The build up to Harry's birthday started about 2 weeks earlier, counting down everyday, talking about what we would be doing and trying to guess what he might be getting. There is nothing like having kids around to keep you young, to keep you focused on the important things in life and to keep your feet stuck firmly on the ground. Alex was also excited about his upcoming event but being that little bit older kept the excitement a little closer to his chest. Our little Alex really is starting to grow up, fun to watch but at the same time sad to see. Wouldn't it be nice if they could stay young and inoccent forever, or would it?? While on the warm and fuzzy stuff, we often get asked what is the best part of extended traveling. So what is the answer? Is it exploring, seeing new and exciting things, is it having the opportunity to live in places that most people are not even allowed to visit? Could it be being able to work in so many exciting places, seeing and doing so many new things, but not being there long enough to get caught up in work politics? Is it having the pleasure of meeting great people, many of who will remain friends forever? Well yes, all of those things are important, but if I had to pick the absolute best part, the part that we would not trade for anything, it would be seeing the kids all day, everyday. Back in normal life (if that is what it really is, and a life we will eventually have to join again) most parents would be lucky to see their kids for 4-5 hours a day, or even less, through no fault or desire of their own. Work, school, sports and friends, really eat into the amount of time parents get to spend with their kids. What are these kids learning, seeing and doing during all those other hours, away from their parents??. Some would argue that the kids are learning independence, learning life skills ready to eventually join the adult world. Maybe???? While I am not in any way criticising anybody living a 'normal' lifestyle, we consider ourselves so lucky as we get to be with the boys 24/7. Even when I am at work it is usually only next door and are able to drop in home every few hours at worst during the day and then home for an hour at lunch. So for Chris and I, the best part (by a country mile) of extended travel is the amount of time we get to spend with the boys, for as we all know, our little babies grow up so very fast, and within a flash of time, will be leaving home and building their own lives. I am not sure how we will cope with that??? So back to September. First cab off the rank on the 4th was Harry's 8th birthday. As I said earlier the build up was bigger than the Olympic Games. He was awake at some disgusting hour sitting on the end of our bed, about to explode with excitement. We had the house decorated with posters, balloons and streamers. 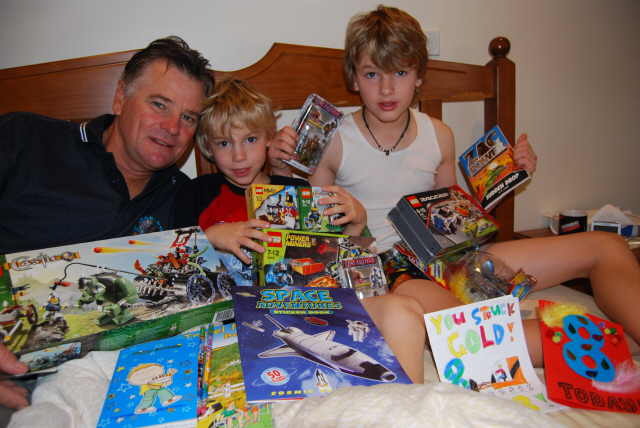 The present opening resulted in even more Lego and numerous other bits and pieces. 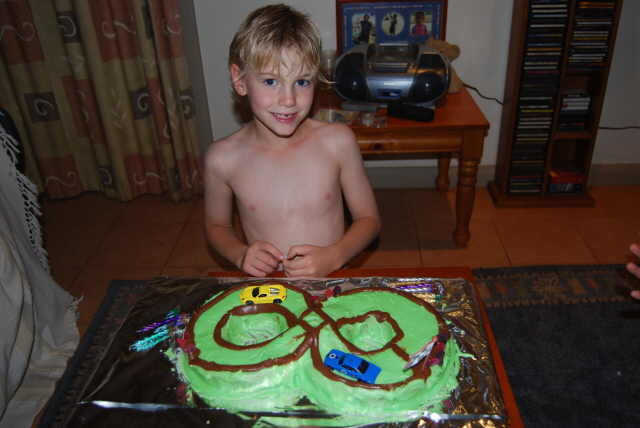 A special birthday dinner, his choice of course, and then the birthday cake made and decorated by Alex. Next was Father's Day which I was on call for, but luckily it was very quiet in the work department. We had the pressie thing in bed and then the yummy cooked breakfast, cooked by the boys. It was a lazy, low key but enjoyable day. Then only a few days later we had to do it all again for Alex's birthday. A bit of useless trivia. Both the boys were actually due (as in to be born to this world) on the same day. We chose to manipulate mother nature and separate their days of birth, so they would have their own special days. Perhaps now with hindsight, it may have been easier if we had not meddled and had them on the same day. Would have been a lot less work!! 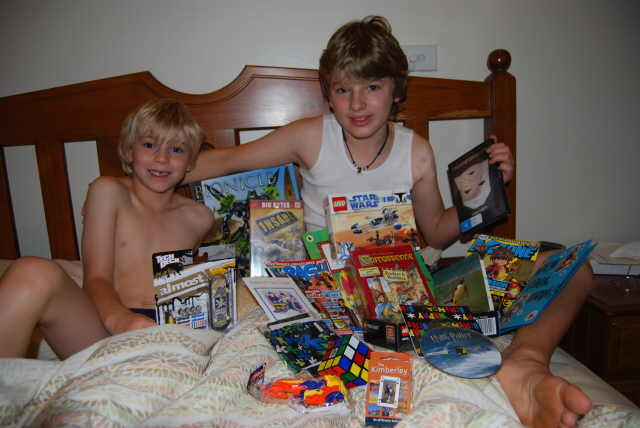 Again the big fella (now 12) was awake much earlier than usual and climbing into bed with us. He too scored very well, in part thanks to Ros and her son Ben, from Bundaberg, who Chris asked to do some shopping for us, as shops out here are somewhat limited, as is the shopping in Broome. 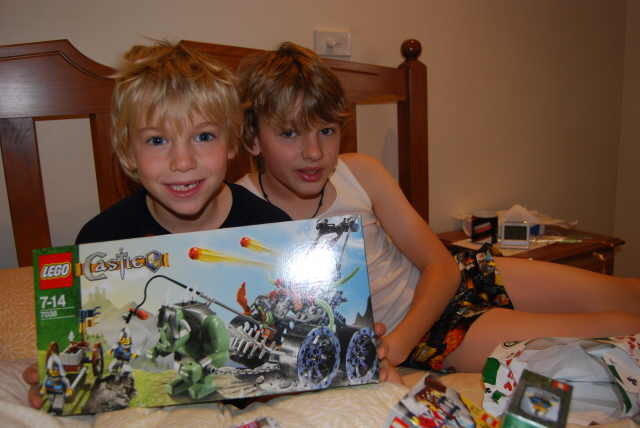 He also got some Lego Bionicles and some extensions for one of their favourite board games, Carcasonne. It is a fairly complicated game that both Chris and myself really struggle to understand. I think this new extension will do us in. We might have to stick to Snap. 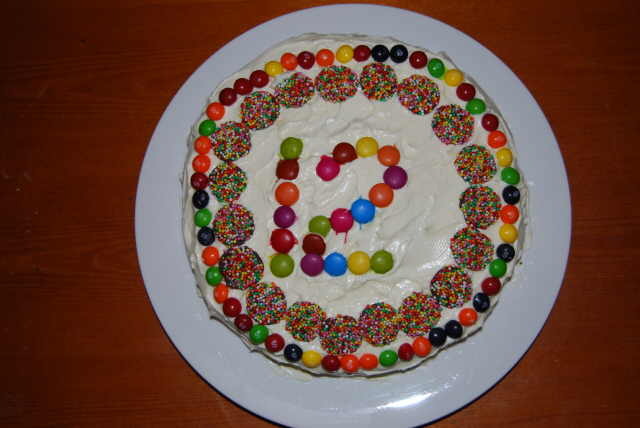 Then another special dinner of his choice and then a cake, decorated this time by Harry. As we said last month the boys have been going to school for a day or two a week and Chris arranged a class party for Harry. 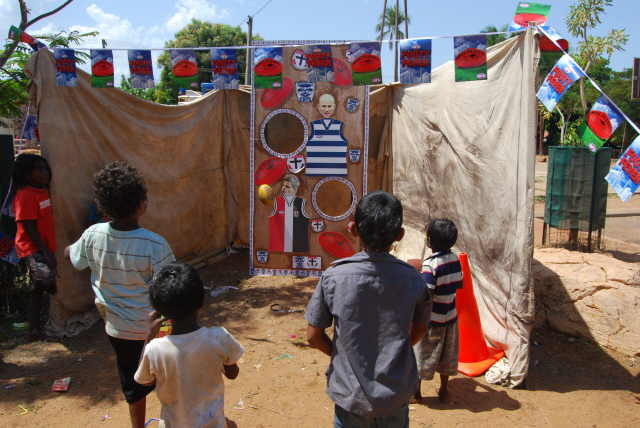 They had all the usual party games - musical chairs, pin the tail on the 'dingo', a balloon race and many more - prizes and party food, as well as a cake. I am not sure who had the most fun, the local kids or Harry (or his teacher for that matter!!). Then Alex's teacher arranged for Alex to have a class party after school over at his house. He often has after school parties as a reward for good behaviour for the kids in his class, so we simply combined the two events. He has a table tennis table and one of those silly Wii games connected to a roof mounted projector and 'Guitar Hero World Tourer'. There are a couple of guitars and a drum set and they endeavour to knock out a tune. Chris arranged the party food and the cake. As with Harry's class party the best part was the local kids singing 'Happy Birthday' at full volume, out of tune with their local slant on the song. 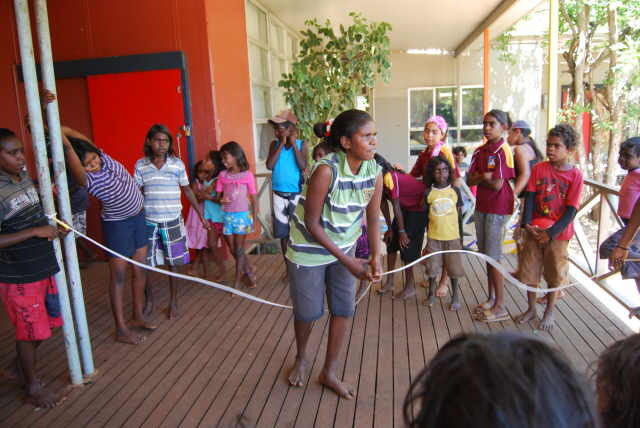 As well, every Friday at school parade, anyone that's had a birthday during the week has 'Happy Birthday' sung to them by the whole school, after their very cute rendition of the National Anthem, complete with digeridoos. Harry was the only one for his week, while Alex shared his with a couple of other kids and teachers. Yet some more of those special moments we will remember forever. So the rest of the month was spent doing a few last things we wanted to see before leaving Kalumburu. One last visit down to McGowans Beach for sunset and then on our last weekend in town when we should have been doing some serious packing we went to visit another beautiful waterhole about 20 kms from home along a fairly average dirt track. 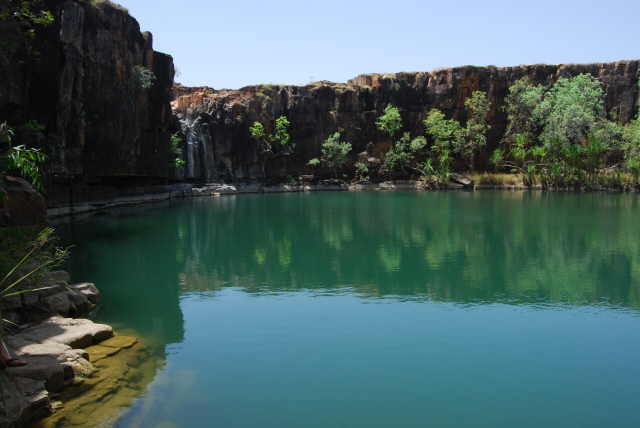 Mamma Pool is a large very deep crystal clear water hole about the size of a football oval surrounded on three sides by high sheer cliffs. Unfortunately the waterfall was no longer flowing but it was still an amazing sight. 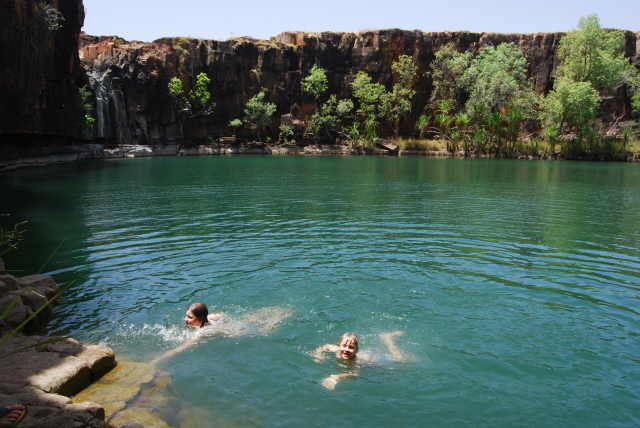 These water holes cannot be accessed until around Easter due to the amount of water in the creeks so there are only a few months of the year that you are actually able to utilise this beautiful natural swimming pool. We had a great swim before heading home for the final stages of the packing. 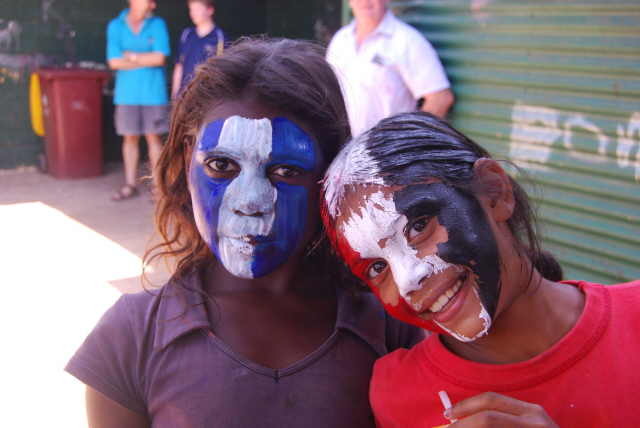 Another major event for our last weekend in town was the AFL Grand Final. We have all become obsessed footy fans and watch the AFL whenever there is a game playing. 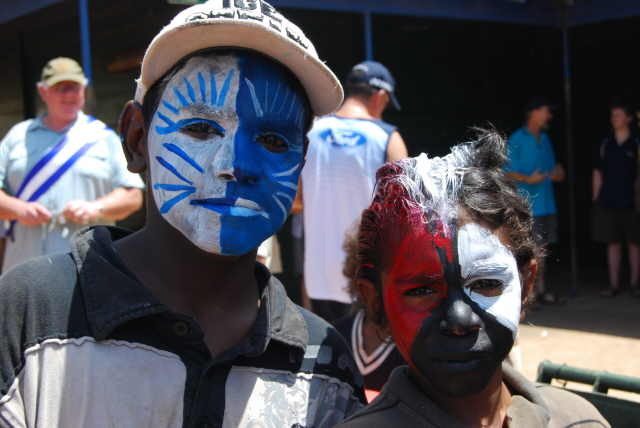 As with all aboriginal communities the locals are totally AFL mad and grand final day was huge. 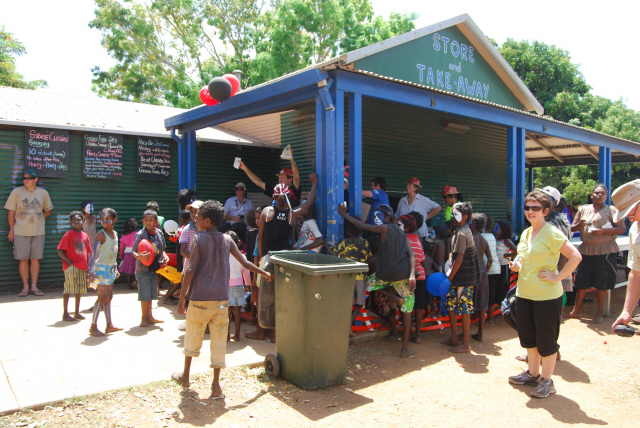 The shop closed early, there was a sausage sizzle, face painting, raffles and many other activities. Every house had huge flags of their favourite team flapping in the breeze and they even had their cars decorated in their favourite colours. Fifteen minutes before kick off the town became deserted, not a person to be seen. We did get invited to the police sergeant's house to watch the game and have a bit of Aussie grub but we chose to stay home to yell and scream in private. I am not sure if it is human nature, or a Parfitt thing to leave everything to the last minute. For 4 months we had planned to go to Church on a Saturday night as we have been told it is very entertaining. Kids screaming, dogs wandering through and technology that apparently never goes to plan. We finally made it and it lived up to all our expectations and to all the stories we had been told. It also happened to be confirmation night for quite a few school kids, so witnessing that was a special treat. A couple of the local blokes playing the guitar and a few local ladies singing made for a pleasant time. Chris and the boys had their last day at school as well last week. As Chris said in an earlier update she has really enjoyed her time at school and that little bit of extra money has been handy. The boys have also had a good time, perhaps have not learnt a huge amount but have had fun and experienced something rather unique. So our time in Kalumburu has come to an end. We will again be very sad to leave but excited to move on to another adventure. We have been out there for over 5 months but had 5 weeks out exploring the Gibb. We made some good friends, again saw some amazing things and will carry the memories of this place with us forever. 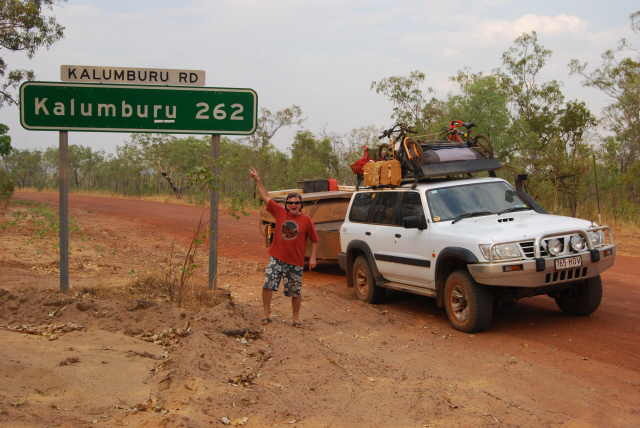 How many people can say they lived in Kalumburu - The End of the Road. The locals here are an extremely friendly bunch and really welcomed us all with open arms into their community. To be bestowed that degree of welcome is very much a privilege. They are a caring, gentle bunch and showed a great deal of interest in us as a family. As we were about to drive out, car and camper again connected in our driveway a number of locals made the effort to come around to the house to say goodbye, which was really nice as white fellas come and go from these communities constantly. It would seem that we must have made an impression (or they just wanted to make sure we were actually leaving). We drove past the clinic, fully loaded up to take the house and clinic keys back and had a huge farewell of waving and good wishes from the locals sitting outside the shop. It does make you a bit sad, but we are nomads and need to keep moving, for another 18 months at least. 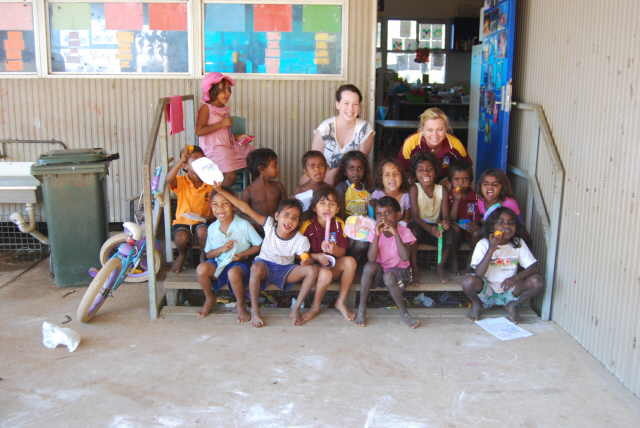 Well down the track when the kids are off our hands we could see ourselves again in Kalumburu for 6 months. So many choices, so many opportunities, so many things left to do. I am so glad as a family we are out there 'living the dream', taking some risks and living outside the square. We have been asked many, many times by the locals if we will come back to Kalumburu. 'Never say never' is our motto, who knows what will happen next year.